Mind boggling. That is how I felt last night when we were talking about school. Both kids had tests yesterday. Both mentioned how they had to finish them today. I asked what they meant finishing it a day later. Apparently that is the norm in our school system. If you don’t finish it in time that is ok. This just blew my mind. Growing up if I didn’t finish a test in the set amount of time that was on me. This really concerns me because as a parent I want the best education for our kids. I don’t want education to be a limiting factor to whatever progress our kids make. Last year the US was ranked 14th in the world when it came to education. The past couple of years think tanks have mucked about with different ways the kids should be taught without really vetting the programs. Common core has been a nightmare. I’m sorry 2+2 does not equal 5! I get that kids should learn to think through the process and understand how they got to the answer but it is not ok if the answer is wrong. It is hard for me to understand the overall disconnect between what I see our teachers doing locally and how our students stand vs other countries. The teachers our kids have, bar one, have been amazing. They are dedicated to our kids, they work long hours, they work to try to tailor lessons for each student, and communicate with us. So I have to think our system is held back at the higher level. For example there is an OK senator who wants to cut funding to the AP History classes because it “teaches students what is bad about America” It doesn’t promote “exceptionalism”. Constantly chanting “We’re #1” isn’t leadership, it’s insecurity. To rise back up the ranks, kids need to have positive learning experiences while being prepared for the real world. They need to stop being let down by those who forget separation of church and state actually exists, to be allowed to actually learn science and the truth about history, and to know that 2 + 2 doesn’t equal 5. We are fortunate that our kids love to learn and seek out ways to learn new things. But not all kids have that support. We did have a nice meal to go along with the enlightening conversation. I was in the mood for meatballs and wanted an Asian flair. And guess what my husband found at the co-op? Galangal! How cool is that? 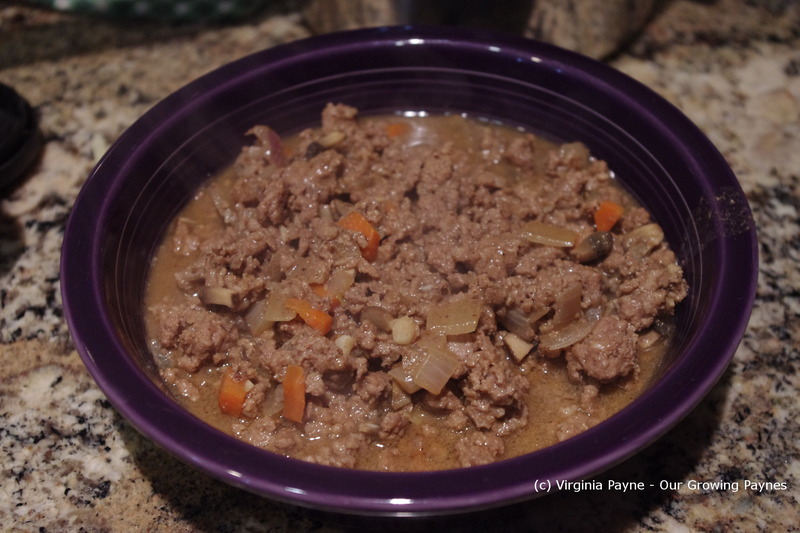 In a bowl I mixed up a half pound of beef with a few tablespoons of freshly grated galangal. I found it to be very dry and flaky. 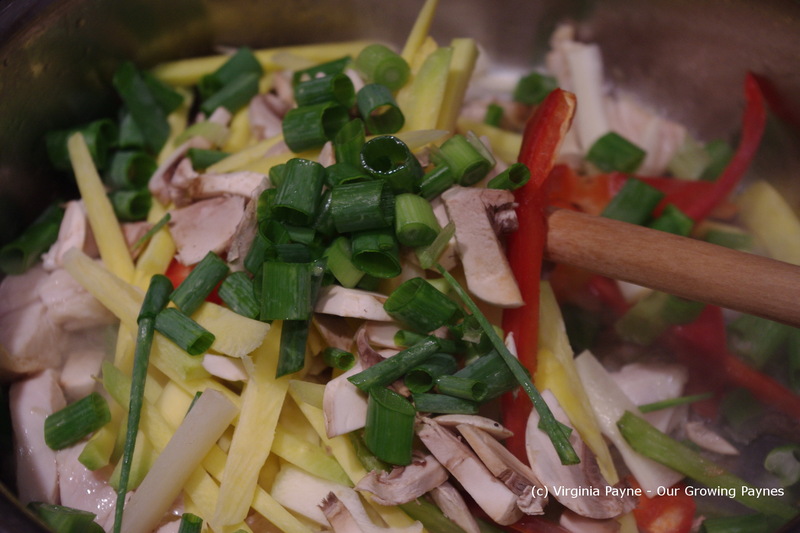 I also added chopped chives and couple of teaspoons of amino acids. Otherwise known as gluten free soy sauce. 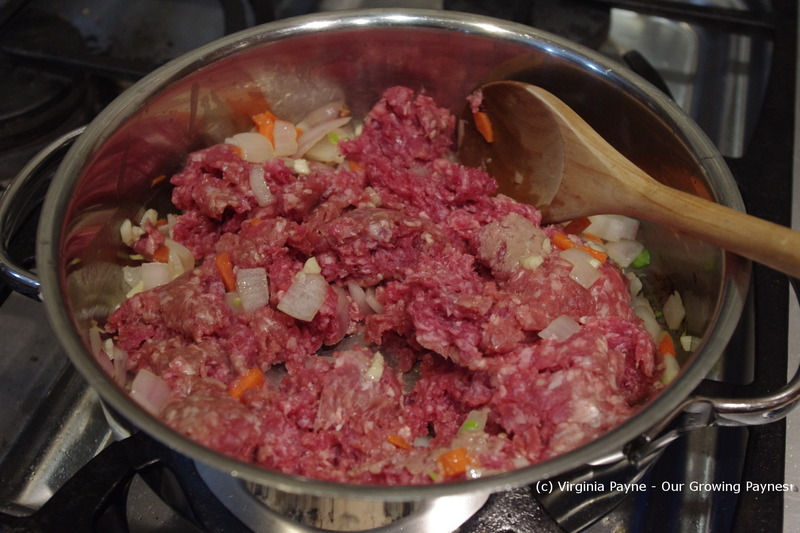 Then roll the meat into meatballs about an inch to an inch in a half in diameter. In a skillet heat up a few tablespoons of peanut oil. Brown the sides of the meatballs then finish off in an oven heated to 350F/175C. 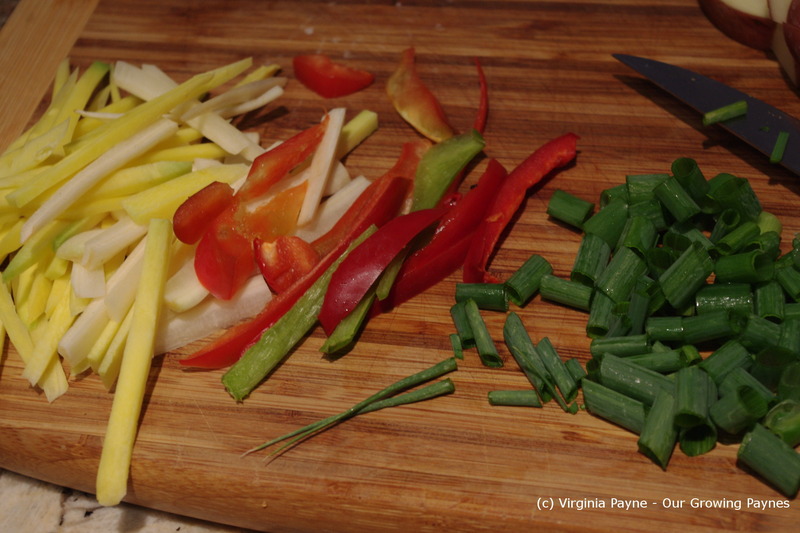 Meanwhile, saute chopped veg of your choice. 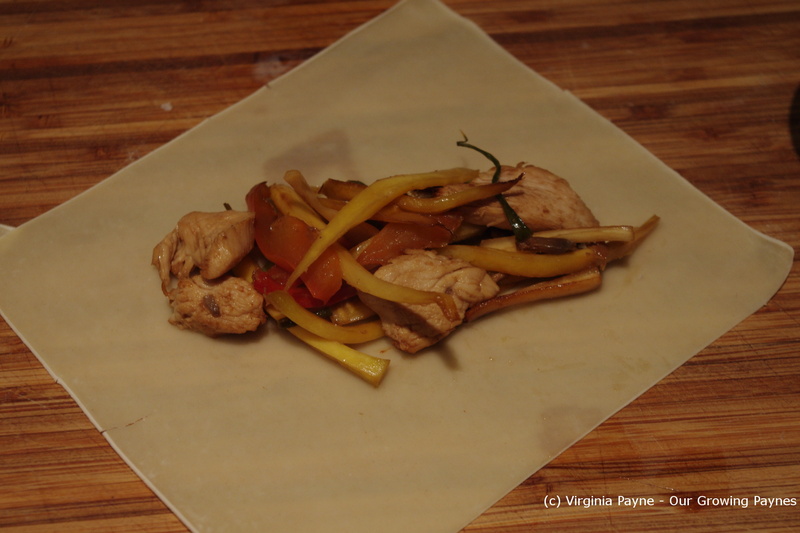 I did up peppers, scallions, garlic, carrots, and mushrooms. I messed up on the portion of sauce vs the portion of rice noodle. I made enough sauce for two people but enough noodles for 4. So I would double what I’m putting here. Otherwise the dish ends up bland and trust me, the sauce wasn’t bland! I added 2 tablespoons oyster sauce, a couple of teaspoons of amino acids, a few splashes of fresh lime juice, and a teaspoon of red pepper flakes. 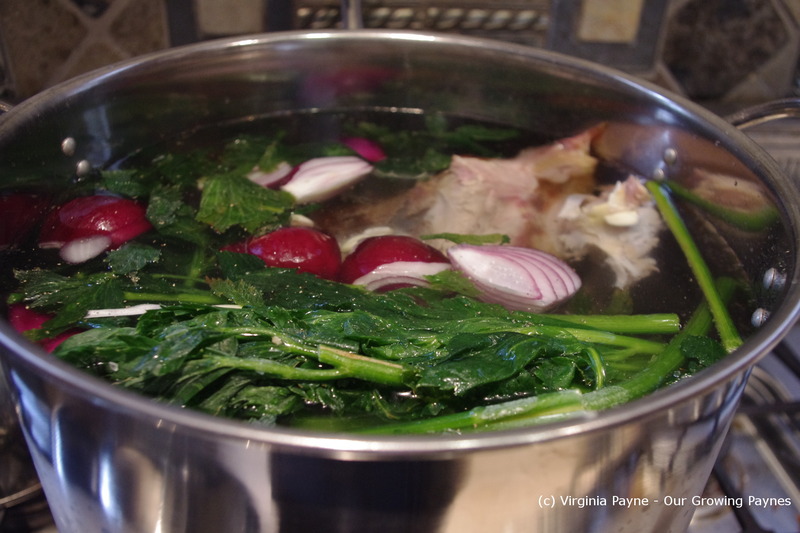 Bring to a simmer and add a cup of homemade chicken stock. Reduce down a bit then add the meatballs. Cook the rice noodles per the directions then serve with the meatball sauce. Next time I make this I will definitely increase the sauce because the flavour was amazing. Just wish the rice noodles hadn’t dulled it down. The sun will be starting it’s journey back our way today. This makes me happy. I’m not a fan of the shorter days. After getting tired of not being seen walking the dogs we bought them LED lights to hang from their collars. They are super bright so that should help with the close calls trying to get across the roads. Luckily they don’t seem to bother the dogs and they have an added benefit of lighting up the area they are sniffing so I can see if they are about to eat something they shouldn’t! With all that has been going on the past few weeks I lost track what was in the fridge. I have a bad habit of buying ingredients when we already have them because I don’t see them in there! At some point we bought a bunch of carrots and I needed to use them up. I have been wanting to try a carrot soup. It’s funny growing up the only way I liked carrots was raw. But tastes change. 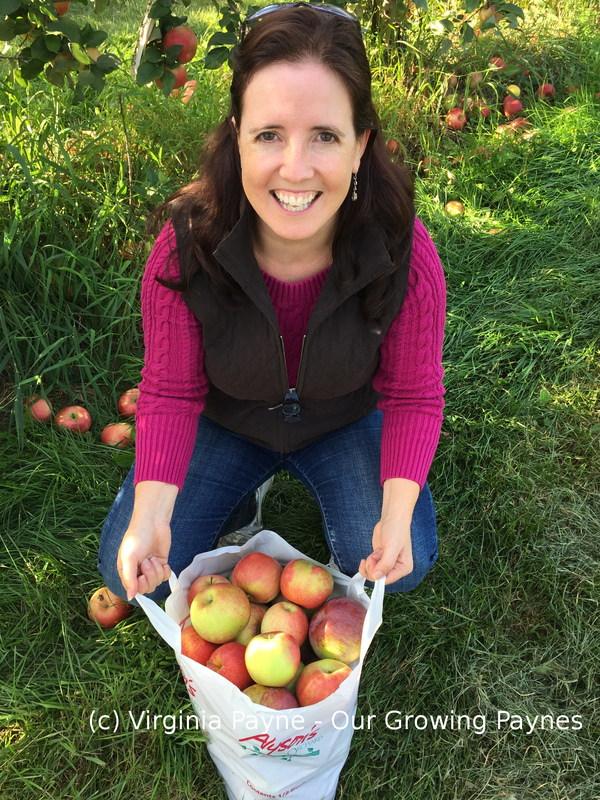 I should say I only liked organic ones. I don’t know what it is but conventional carrots are always dry to me and not as sweet. I know for most things the taste difference isn’t huge between organic and conventional but things like tomatoes and carrots I find a big difference. 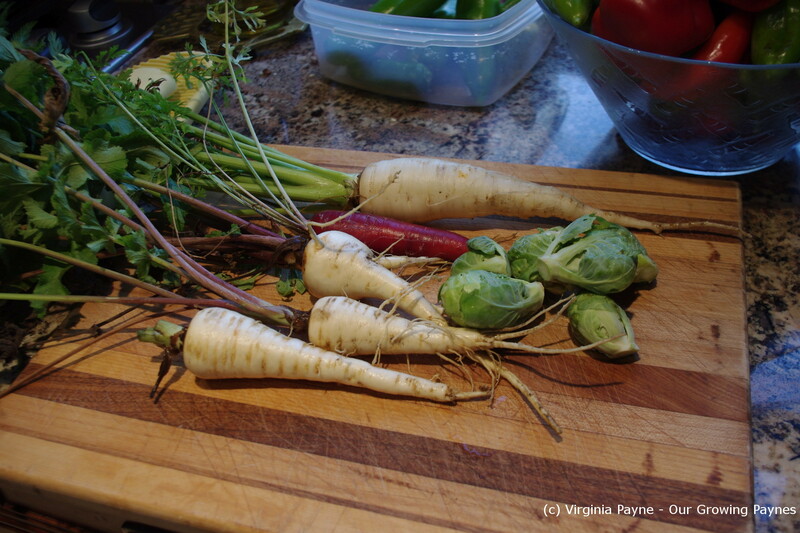 Organic carrots seem to have more water and sweetness to them. I found this carrot soup recipe that looked really good and adjusted it to the number of servings we needed. Their recipe said it would be 8 servings but I made what I thought was enough for 4 but it was really closer to 8 so who knows how much soup the original recipe would have made. 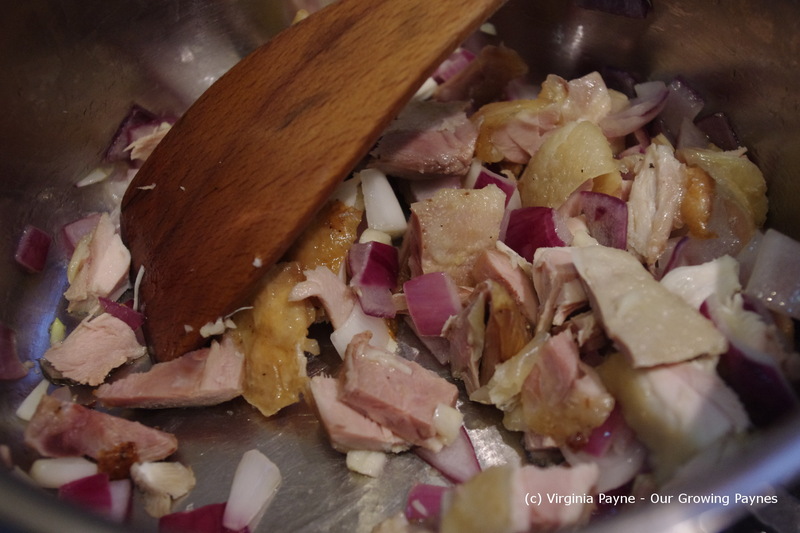 Finely chop a 1/4 of a large red onion and saute in about 2 tablespoons of butter. While the onion is cooking peel and slice 3-4 medium sized carrots. You want at least two cups of sliced carrots. I think I ended up with nearly 3 cups. 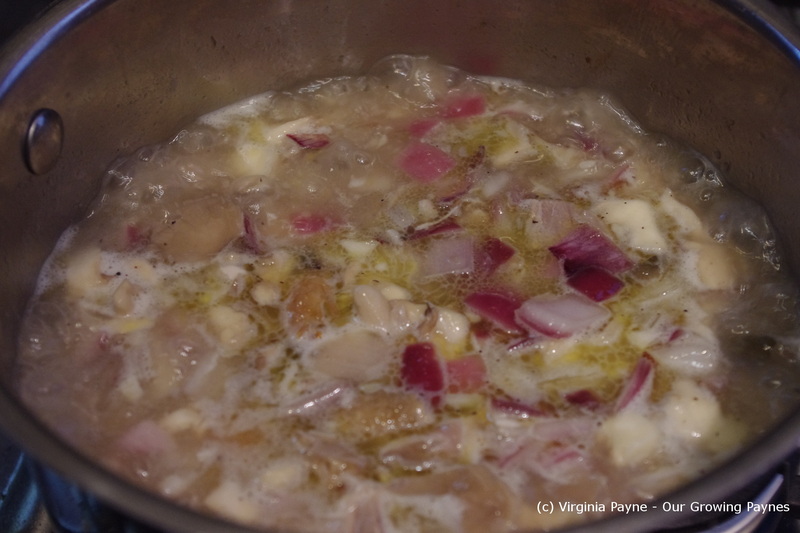 Add them to the onion and stir well then add 2 cups of homemade chicken stock. As it is coming to a boil grate about 2 inches of fresh ginger into the soup, season with salt and pepper, then stir well. Simmer until the carrots are tender and cooked. This took about 45 minutes for the carrots I had. Then use an immersion blender or a regular blender to blend all the ingredients. Put back on the heat and add 1/2 a cup of heavy cream. Adjust the seasoning with salt and pepper as needed and warm up as needed. Serve with a dollop of sour cream. I’m a firm believer in that people should make what they will of recipes. After all they are the ones that have to eat them. So not a lot irks me when it comes to food. Except maybe this bit. People calling cottage pie shepherd’s pie. So indulge me a moment as I’d like to get up on my soap box. Ahem, here we go. Shepherd’s pie is made with lamb. Easy to remember as sheep get herded by a shepherd. Shepherds don’t herd cows. Therefore a shepherd’s pie doesn’t have beef in it. Which is why it is generally known as cottage pie. Thank you, I will climb down now and put the box away. 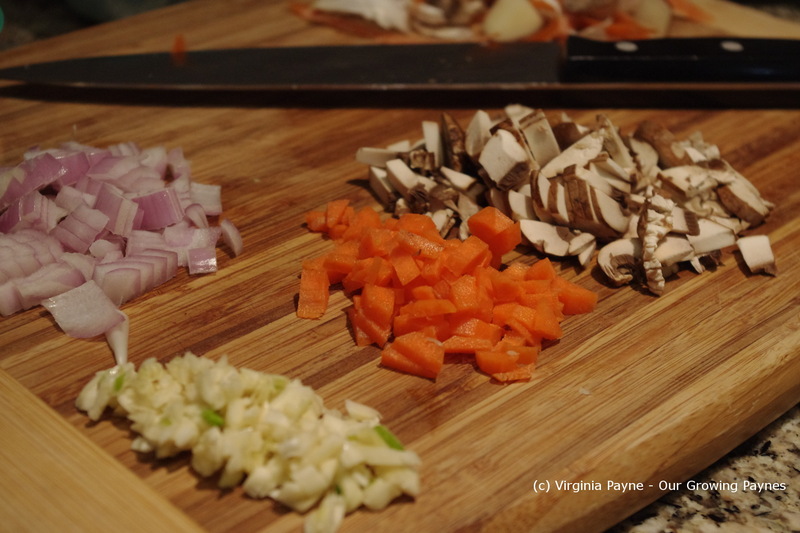 To start I chopped up carrots, garlic, onion, and mushrooms. 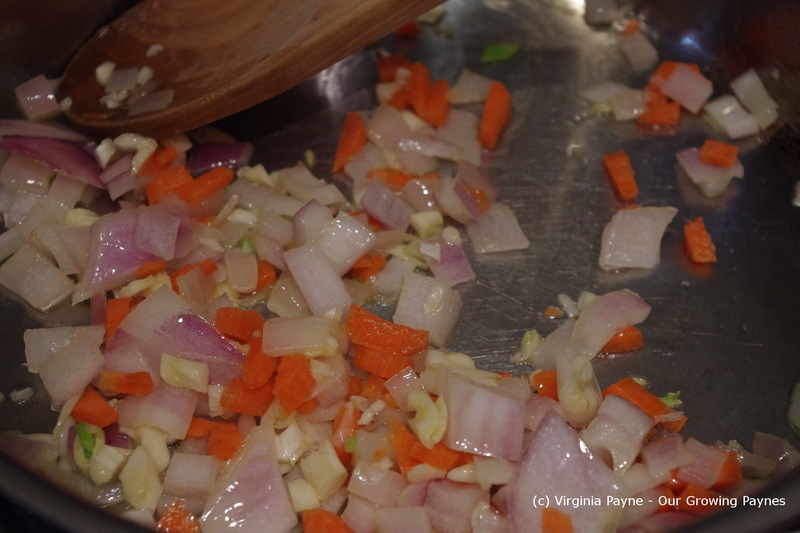 In a bit of olive oil I saute the carrots, garlic and onions. 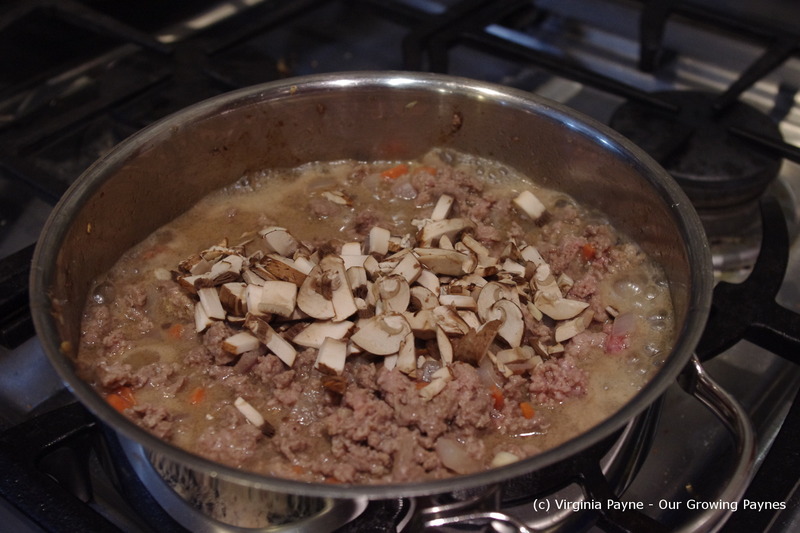 Once the onions are a bit translucent I add the beef to brown. I used our veg broth for this. In hindsight I probably should have used 1/2 cup but I used 3/4 cup of broth. I added the mushrooms, 3 tablespoons of Worcestershire sauce, and a good squirt of stone ground mustard and brought it to a simmer. In the meantime boil potatoes for the mash to go on top. 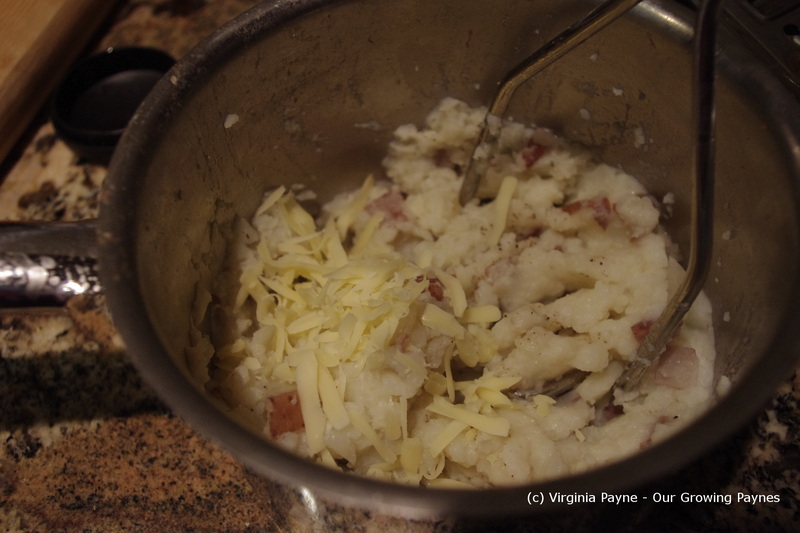 Once they are cooked I added a healthy pat of butter and enough milk to make it smooth. I wanted it to be easy to put over the beef. I also added some grated Jarlsberg to mix in along with a bit of salt and pepper to taste. And yes I do keep the skins on. 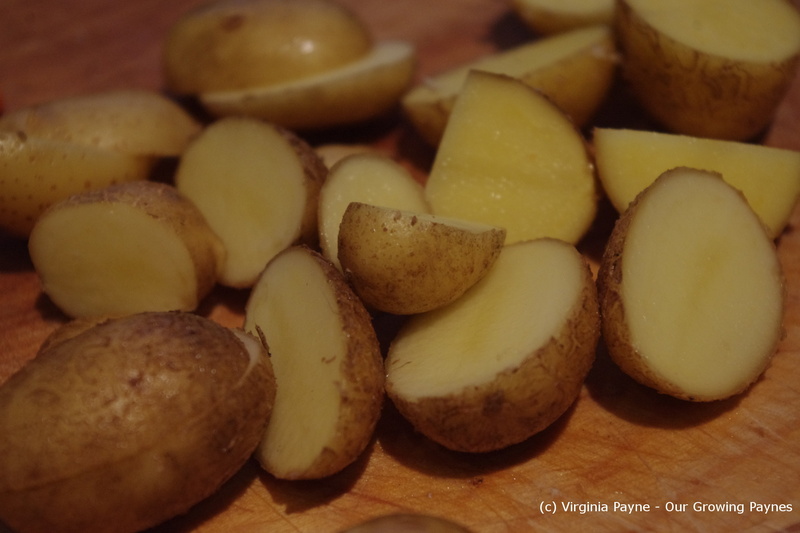 Adds colour and keeps the nutrition with the potato! As it was just my husband and I the dish was kept pretty rustic. I divided the beef mixture into two bowls for us. 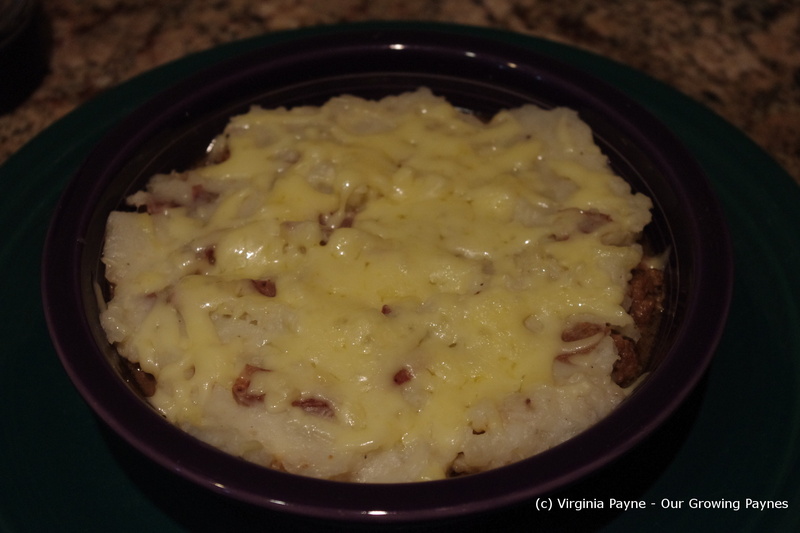 I spread the mash over the beef and shredded more Jarlsberg over the mash. Stick it under the broiler until the cheese is melted then it is ready to serve. 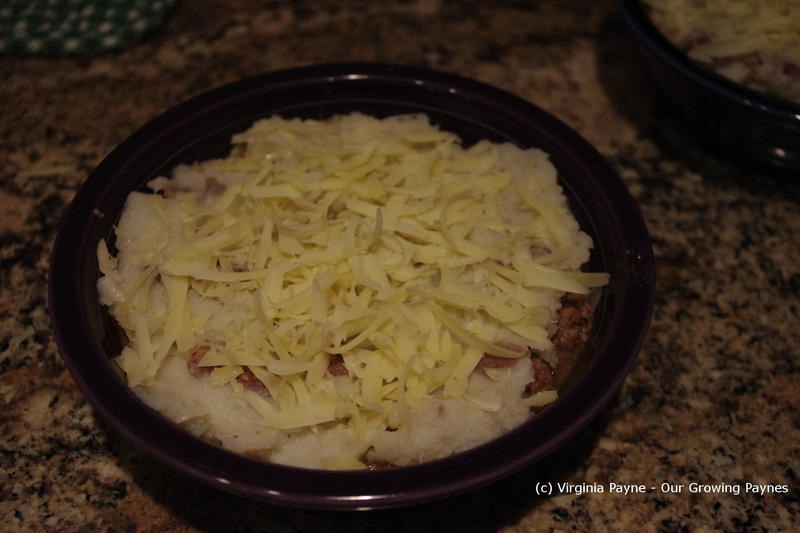 My husband, who isn’t normally a huge fan of cottage pie, enjoyed this one. 🙂 And it was lovely with red wine. 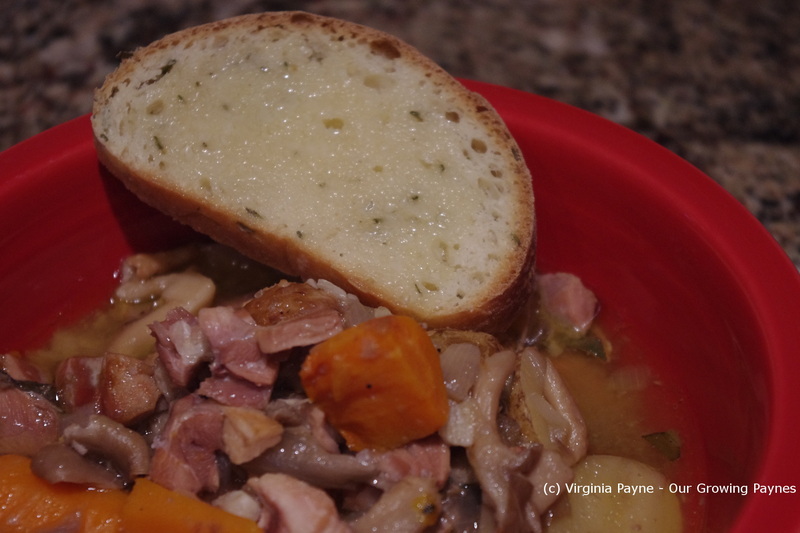 You will want a large pot, especially if you are doing this with turkey. We used our brew pot which holds a few gallons. 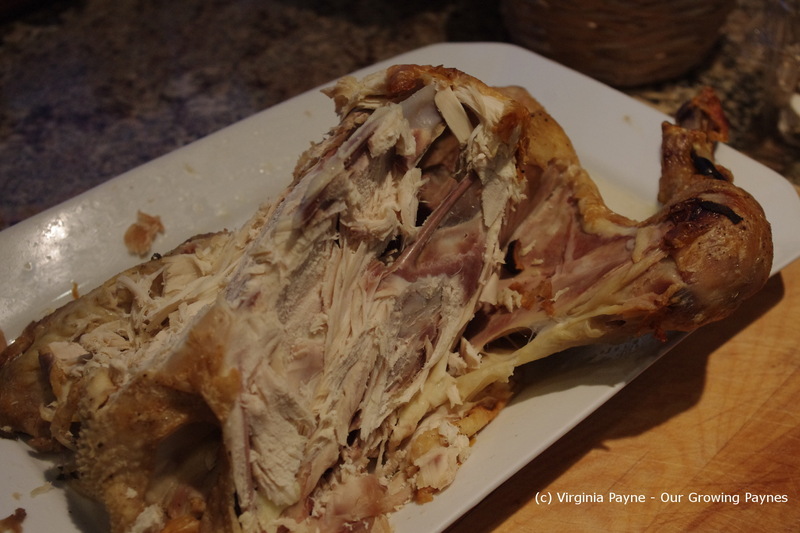 It was deep enough if I broke up the turkey a bit. Cut off most of the meat. 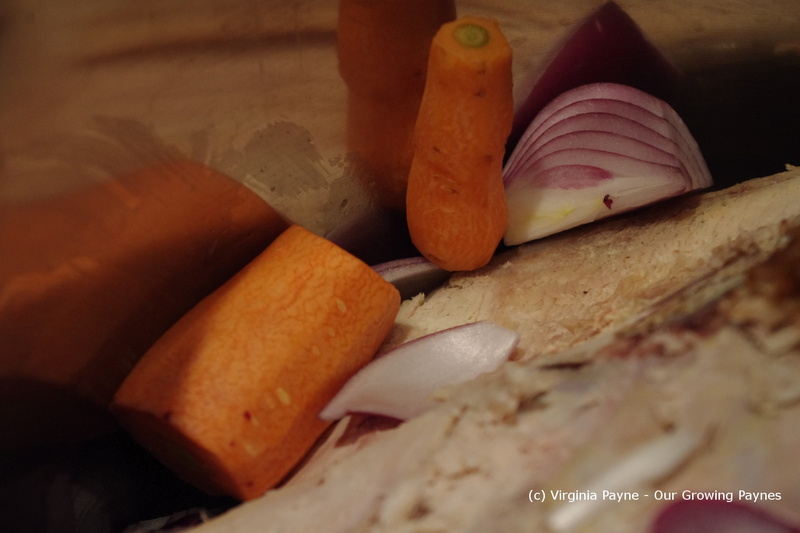 Some meat is ok.
Add an onion quartered and a large carrot which has been peeled and cut into large chunks. These were our last carrots from the garden. I also added a few crushed cloves of garlic. We had frozen some celery from our garden. It worked out quite well for this application. You want the green leaves of the celery for a tasty stock. I don’t understand why the stores seem to insist on selling celery with the leaves chopped off. 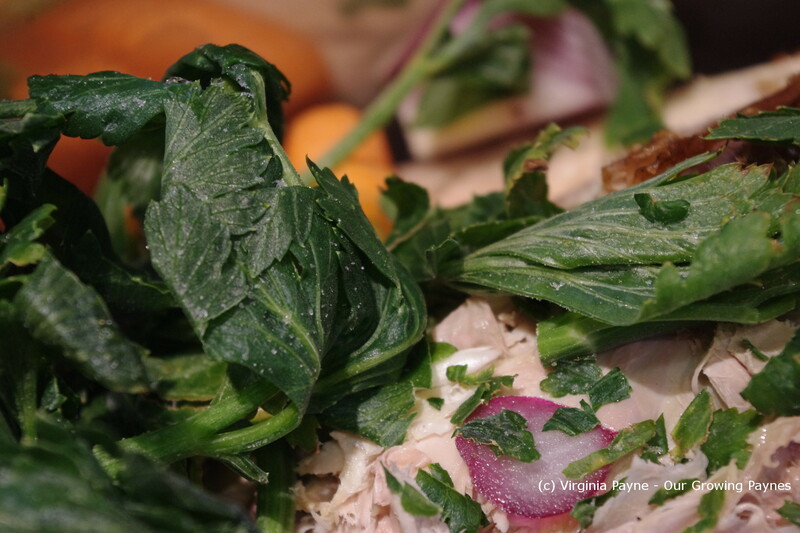 There is so much flavour in the leaves! It’s a main reason why we grow our own celery. Add sea salt and pepper to taste then fill the pot up with water. Bring to a boil then simmer for 2-3 hours. When this is nearly done prep the jars by sterilizing them for 10 minutes in boiling water. 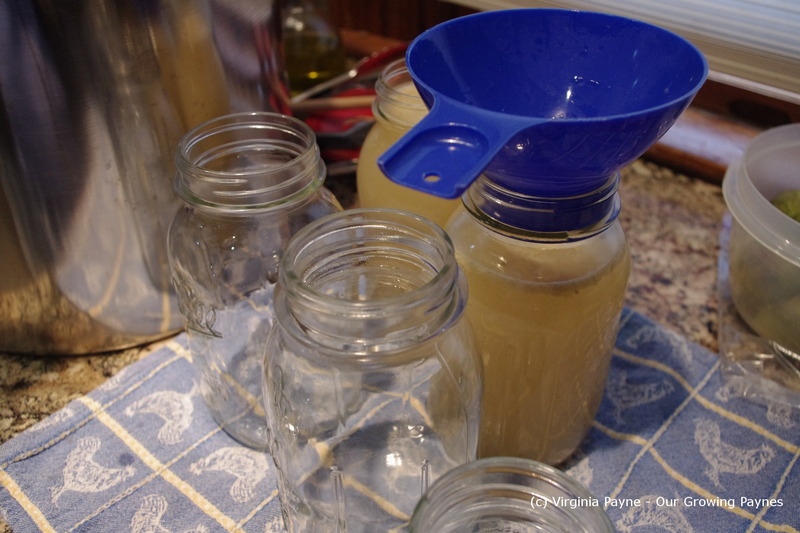 Then fill the jars with the stock. 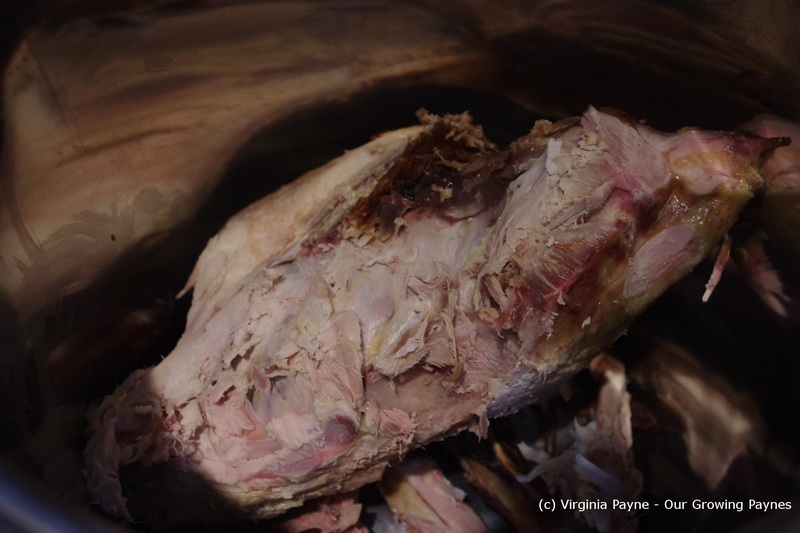 I know a lot of people spend time skimming the stock and removing fat but given the amount of fat versus the stock amount this is a relatively low fat stock. As is works very well for us and our recipes. 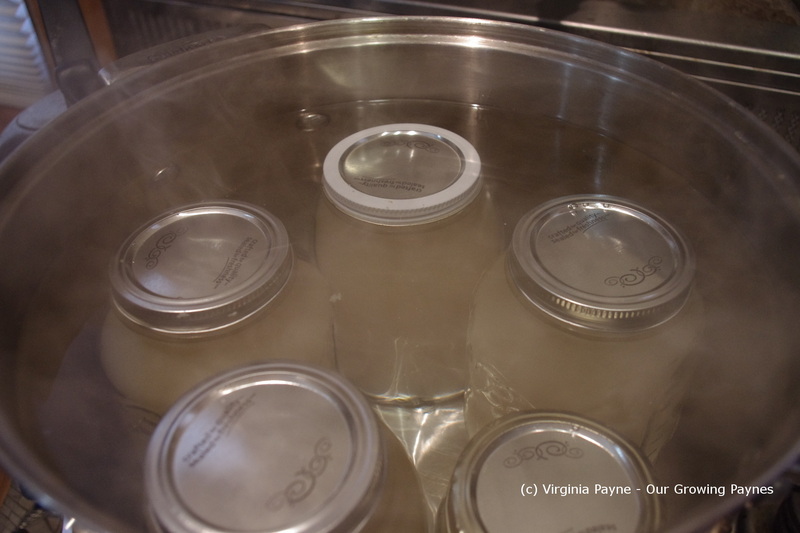 While I am filling the jars I turn the heat on the water I used for the jars all the way down and toss in the rings and lids. You don’t want to boil the lids. Once the jars are filled I put the lids and rings on. I tightened then put them back into the water and bring to a boil. Once boiling I process for at least five minutes. The last bit that I did for the Sunday Roast was to do up some roast veg. I have to apologise about the photos. I have an excellent camera and lately I must be rushing and so some photos have been coming out a bit blurry. As in this post. I need to slow down! We grow a wide variety of veg in our garden. 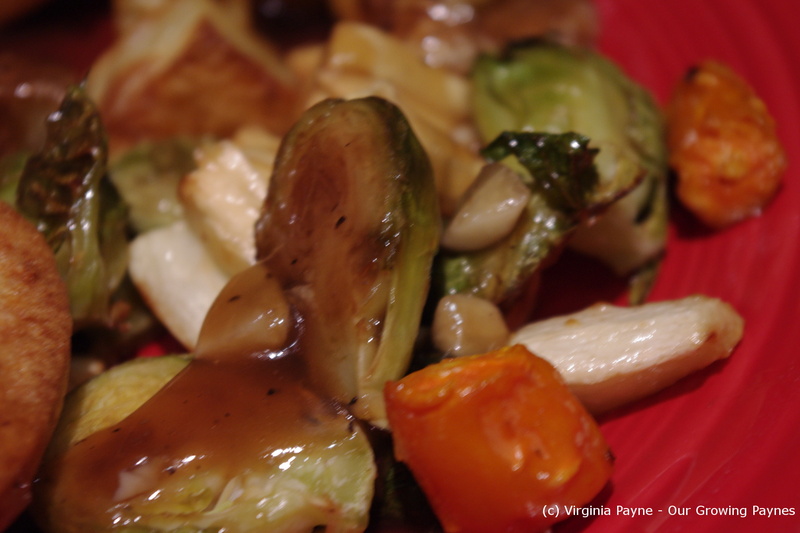 For this dish we have parsnips, white carrots, red carrots, and Brussels Sprouts. As we had our first frost already it was perfect timing for this dish. I roasted these in the same oven as the roast beef. I put a pan with olive oil into the oven to heat the oil. I then peeled the parsnips and carrots and chopped them into small chunks. I cut the Brussels Sprouts in half. 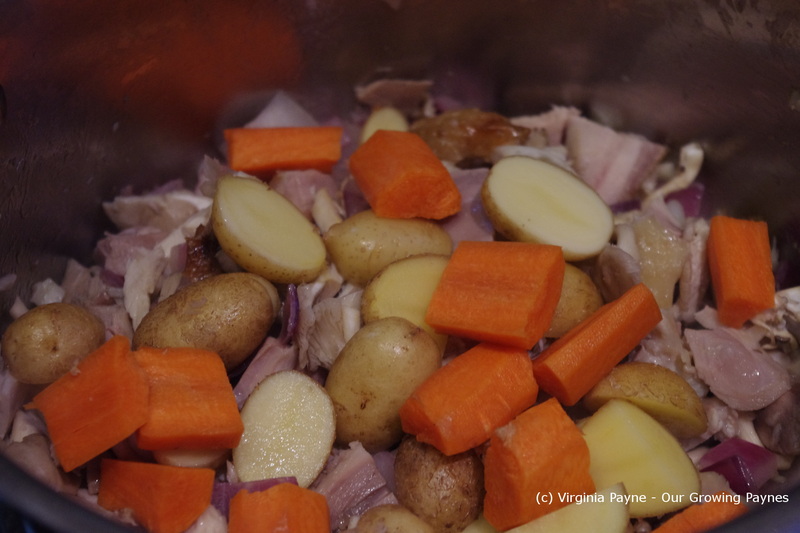 Toss the parsnips and carrots in the olive oil and pop into the oven. When the veg is about halfway done I then added the Brussels Sprouts. Roast until cooked. My husband and I had a discussion afterwards about whether it would be better to boil or microwave the veg a bit beforehand so they roast more evenly. I will be trying that next time. I pour a bit of gravy over the veg to serve. Again the gravy is the same as with the Roast Beef and Yorkshire Pudding. To round out the meal I also served roast potatoes. So the other day I was standing in the middle of the kitchen suffering from the equivalent of writer’s cramp. Cooking cramp if you will. I could not think of what to make for dinner! I had defrosted a small chicken breast so I needed to use that but that’s as far I could get. Have no idea how long I stood there. Finally inspiration hit! We still had some oil out to use for frying and I was in the mood for fries. 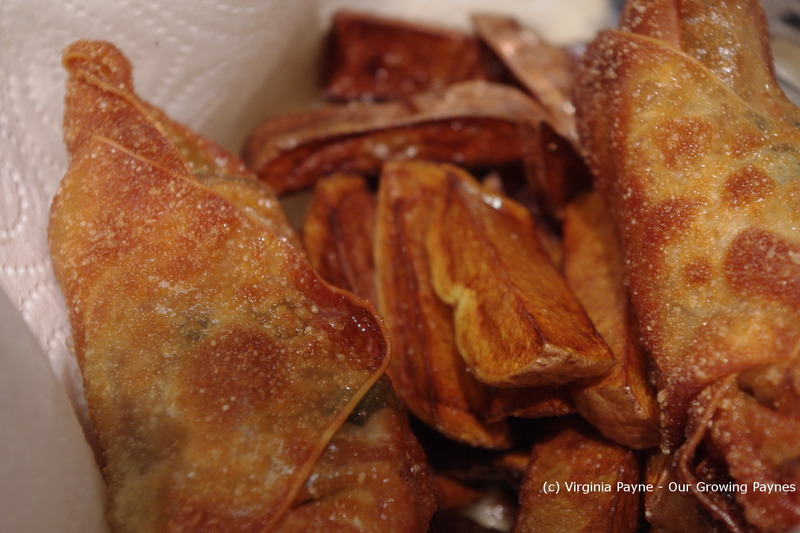 So I decided to whip up some eggrolls. It would let me use some leftover veg we had cut up earlier in the week. All I had to do was grab some scallions from the garden. 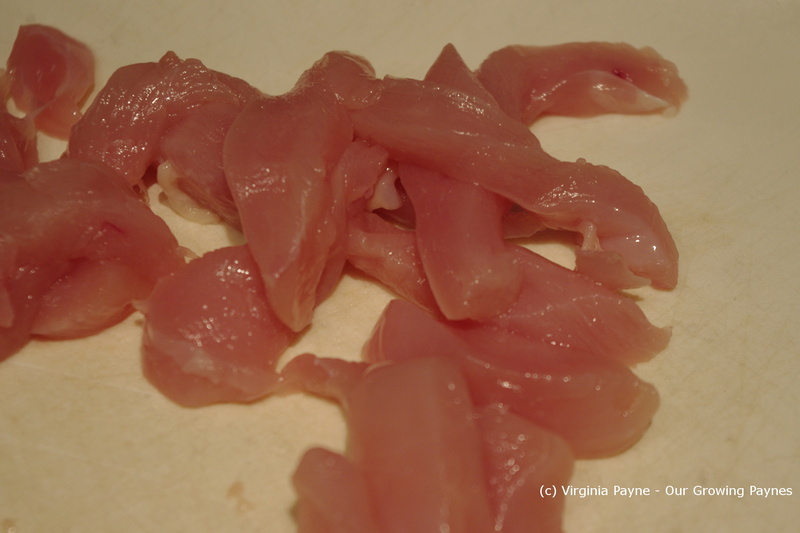 I sliced up the chicken breast into small pieces. 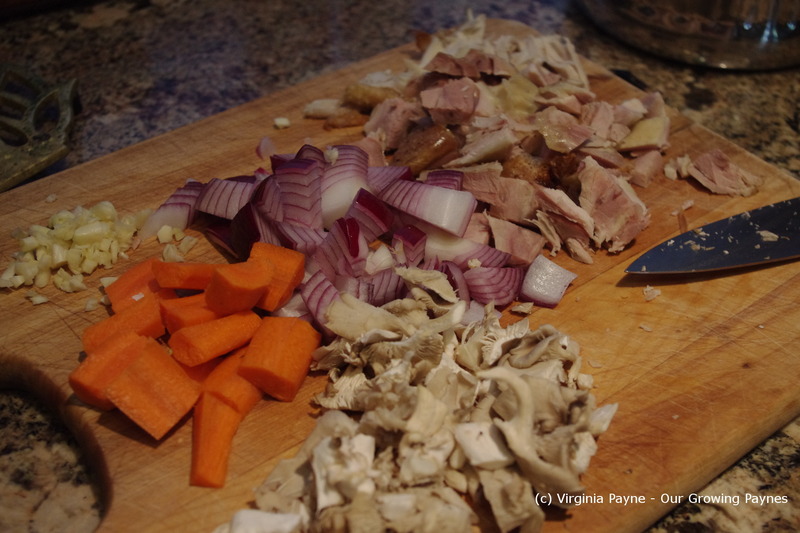 Then I sliced the carrots, peppers, and scallions from the garden plus some mushrooms. I added olive oil to the pan and sauteed the chicken for a minute or so then added the veg. Next I splashed in some soy sauce, rice vinegar, lime juice, and some ground ginger and sauteed until cooked. 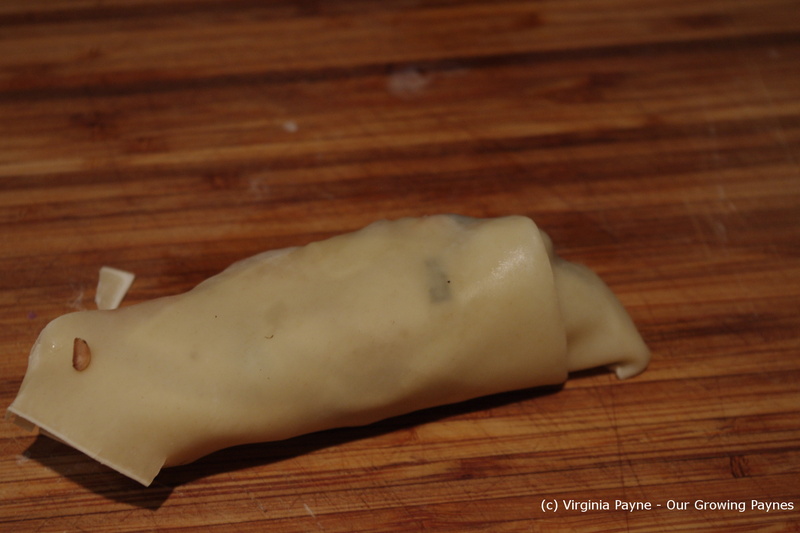 Now the eggroll wrappers have been thawed and frozen a few times so they weren’t easy to handle at this point. Time to get new ones! But I spooned some of the mixture onto the wrap in the center. I roll it up and use water to seal the edges. 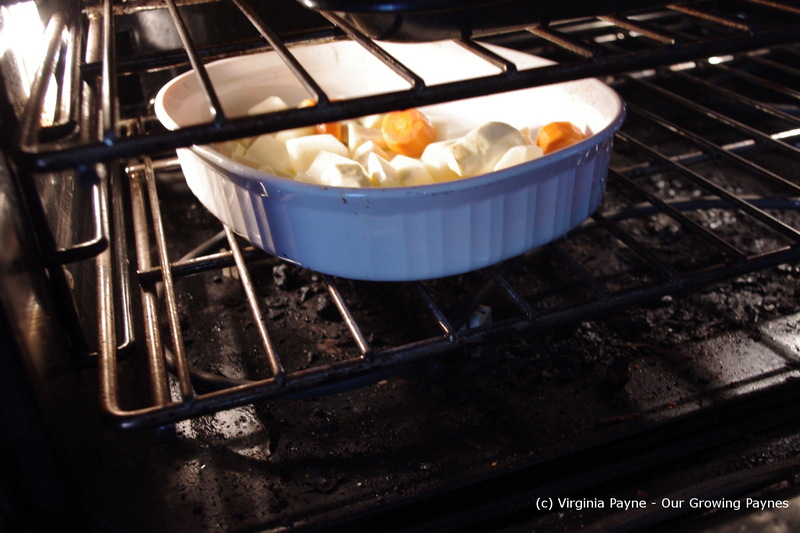 I find it works really well and you don’t have to waste a whole egg. Fry until golden brown and serve with your favourite sweet chilli sauce.